The free Kaplan eBooks are available on NOOKcolor, iBooks (for iPad, iPhone and iPod touch), Amazon Kindle (device and apps) and Sony eReader from January 4 to January 17, 2011. Most of them is for students on various level of educations to prepare for SAT, PSAT, AP, GMAT, MAT, GRE, MCAT and MBA examinations. 9781427798923 Investing in Duplexes, Triplexes, and Quads Loftis, Larry B. 9781427799036 Profit by Investing in Real Estate Tax Liens Loftis, Larry B. 9781607144274 Write for Life, Revised and Updated Edition Kominars, Sheppard B. 9781607142454 MBA Fundamentals Accounting and Finance Griffin, Michael P.
9781607140283 MBA Fundamentals Business Writing Flood, Timothy E.
9781607146872 Lessons from the Courtroom Jones, Frank G.
9781607142133 How to Survive Clinical Martin, Diann L.
Use the following links to access the list of Kaplan’s free eBooks for downloading. Sony eReader: On Reader Daily Edition, at the Homepage, tap Subjects -> Non-Fiction -> Reference, or launch the Reader Library software and go to the eBook Store Reference category. 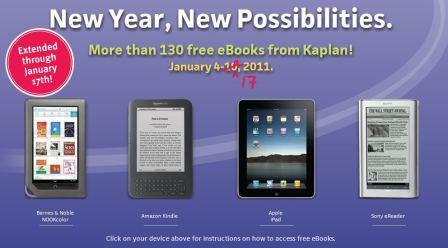 Note that all free Kaplan eBooks in this promotion will carry a $0.00 price tag. Titles priced otherwise are not part of this free eBook promotion.